Vanda married Luigi Scaravelli, Professor of philosophy at Rome and Pisa Universities, with whom she had two children. Sadly and unexpectedly Luigi died shortly after WWII. Each year Vanda rented a chalet in Gstaad Switzerland and it has been said that it was during this time of experiencing the loss of her husband that she first met and observed the Yoga practice of the then titled “Yoga Raja” B.K.S.Iyengar. Vanda’s friend the violinist and conductor Yehudi Menuhin, was a student of B.K.S Iyengar. In 1954 Iyengar was accompanying Menuhin on his tours as his personal instructor , also Menuhin a great humanitarian was sharing the powers and benefits of Yoga embodied in the Yoga adept B.K.S. Iyengar; by introducing him to the UK, France, Germany and Switzerland. During this time they stayed for some months as Vanda’s guests in Gstaad. Vanda spent time observing and then became the student of Iyengar, notably along with her other good friend, Jiddu Krishnamurti. Some years later, the esteemed Yoga teacher and son of Krishnamacharya, T.K.V Desikachar was invited by Krishnamurti to come to Gstaad and there he taught both Vanda and Krishnamurti about the importance of the breath, ‘pranayama’ ~ extension of the breath/life force. How is this Yoga different? “What is this new teaching? A revolution has to take place. A revolution based on one very simple physical truth. There is a division in the centre of our back where the spine moves simultaneously in two opposite directions: from the waist downwards towards the legs and feet which are pulled by gravity, and from the waist upwards, through the top of the head, lifting us up freely. Is this a living practice? Vanda was adamant that this ‘new Yoga’, wasn’t a style or system to be copied or achieved. Instead a way of experiencing connection, an expression of life through which the spine wakes up. ‘Galileo, Newton, Einstein – all worked passionately around this mysterious phenomenon of gravity, which holds the miracle of our existence. Gravity puts us in contact with the spine. All movements we do against the flow of gravity are negative, while those we do along the pull of gravity, in which the ground receives our weight, are positive. While doing the poses correctly, our muscles seem to answer to a binding force collecting them together. This force, responding to the opposite pull of gravity, travels through our limbs and is well accepted by our body, which naturally desires to extend itself. We call this force ‘anti force’. It is similar to the rebounding explosion of a waterfall which, after dropping down at high speed and springing up again with incredible strength, transforms and sublimates its journey by dissolving the water into ever lighter sprays, creating a swirling cloud’. On Breathing Vanda said ‘Breathing is the essence of Yoga. Breathe naturally, without forcing. No pressure or disturbance. Nothing should interfere with the simple, tide-like movement of our lungs as we breath in and out. After a while if we are paying attention , we will find that the last three vertebrae closest to the ground begin to receive life. The energy running along the back of the spine from it’s base to the top of the head increases in power, making the spine alive and strong. Vanda Scaravelli died in Italy in 1991 at the age of 91. 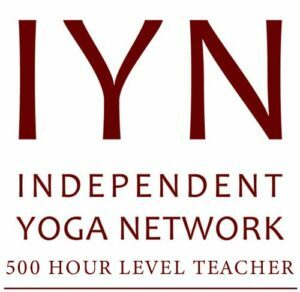 Many teachers continue this exploration of the human being through Yoga, following in Vanda’s foot steps, which has become ‘Scaravelli Inspired Yoga”. Diane Long was Vanda’s, principle student, she studied with her for 23 years and as such is the most directly connected to her. She is known for her directness of communication, her humour and is very popular. Diane is based in Rome but teaches regularly in the UK. Sophy Hoare practised with Vanda in her last year of life which had a profound effect on Sophy, she also met Diane Long at Vanda’s and invited Diane to teach her, they continue to practice and teach together, Sophy lives and works predominantly in the UK. Marc Woolford is known for his extraordinary teaching in the Scaravelli Inspired vein. He has developed a way of introducing students to the conditions in which the habitual patterns of stress related muscular and mental tension can be released and ‘Scaravelli Inspired Yoga’ can be experienced. He has formed the Acquaviva School of Yoga to pass on this work with others, we are very lucky that Marc will be running a number of workshops at Isle of Yoga on the Isle of Wight for 2015. Following in this great tradition Erling studied for his 200 hour Diploma 2 with Marc and embraces this teaching passionately. The student is now the teacher & he teaches workshops, retreats and classes at Isle of Yoga. If you would like to visit the Island and do yoga we have a great place for both. Please get in touch for availability. Will there be an Isle of Wight retreat this year? I have both a connection with the island as my mother grew up there and with the scaravellis as I met her when I au paired for her son, Alberto in the summer of 1983. Without computers or internet in those days I had no idea who Vanda was – just that she had been a concert pianist, knew yehudi Menuhin and practised yoga. I met her at the family retreat in Fiesole. I “discovered” yoga 3 years ago and have been practising it since but with some difficulty as I suffer from arthritis in my hands and wrists. I remembered vanda but couldn’t remember the family surname. After a weekend retreat in Sussex last year, I bought a book written by the man who founded the Triyoga studio. Incredibly there was a chapter on Vanda scaravelli. Now, knowing more about her and her teachings, and after trying different types of yoga, it would be really interesting to attend a workshop based on her own teachings and principles.